I am often asked about outsourcing content and if it should be done. People have different business models. Not everyone is a blogger or creates a website on a passion/interest. For example, your core business may be podcasting, and perhaps that vehicle drives most of your sales. However, you could also have a website with a lot of general, fact-based content that supports your podcast, but is not essential to generating sales. In this case, outsourcing certain kinds of content may be appropriate. Personally, I prefer to write the majority of my content — especially on this blog where I often share my personal experiences, experiments, etc. I can tell you now, you won’t see any outsourced content here. However, since my business has diversified a bit to the offline world, I have discovered instances where outsourcing is necessary for certain kinds of informational content. For the record, I don’t consider guest posts to be outsourced content. I am talking about having someone else write an article as if it’s coming from you. There are many places to outsource content: Freelancer, oDesk, Elance, iWriter, etc. However, I want to talk about Textbroker.com (no affiliation) because you don’t hear as much about this site compared to the others, and I was pleasantly surprised with how fast and efficient the entire process was. First of all, it only takes a few minutes to setup an account. They are compatible with PayPal, so they use the escrow method where you deposit funds into your account to pay the authors once the work is complete. After the quick account setup, you’re ready to submit your article request. I also like that you have control over the quality of your articles. There are 5 levels, with 1 being the lowest (cheapest) and 5 being the highest (most expensive per word). A level 5 article is more than double the cost of a level 4, and since I personally tweak the content to fit my voice, I’ve found that a level 4 is sufficient for my needs. Just to give you an idea, a level 4 article that contains roughly 750 words is going to run around $16. Obviously there are cheaper services out there, but you often get what you pay for. I’m not necessarily looking for the cheapest solution, especially since I don’t use these services often. So far, the grammar and spelling in my articles have been perfect. Also, the authors have done a good job of following my directions for how the article should be written, organized, etc. There’s even an SEO option that allows you to set “required keywords” for your article. I prefer to handle my own SEO and see no reason to use this part of the service — especially with all the changes to SEO in recent months. If you’re not happy with the article, you are free to send it back for corrections/revisions. 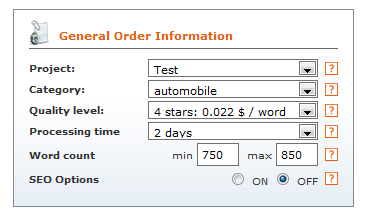 Once you are satisfied, you can rate the work and release the payment to the author. If you’re like me and prefer to write the majority of your content and want to ensure your voice is consistent throughout your site, I think you should use article outsourcing very sparingly. As I’ve already mentioned, I prefer to tweak the article and add my own personal flare to make the content my own. If a big part of your success has come from writing in your own tone and voice, you don’t want to tarnish that by going overboard with outsourcing. The key is knowing when to do it and ensure the content flows with the rest of your work. Having said that, outsourcing a few articles here and there has really been a big time saver for me now that I am continuing to diversify and work on other projects. What about you? Do you outsource any of your articles? What has your experience been like? What service(s) do you use? No, I would never use an outsourcing company, primarily because I’ve worked for them in the past and their rates are nothing but slave labor for any writer who cares about the content they produce. As a writer, I tend to support other writers, so am never going to use a company that does little more than pay them a subsistence wage. I have also written hundreds of pages of content for company website; from small business to Fortune 1000. Outsourcing your writing needs can work when you understand quality writing and you understand your own goals for the project. I have authored hundreds of published articles under my own byline and many more hundreds as a ghostwriter. I have also written hundreds of pages of content for company website; from small business to Fortune 1000. The problem for many buyers of writing services is that they don’t recognize the mistakes in sentence structure or even grammar that they get from cheap writers or writing services. Unfortunately, many of their readers will spot these mistakes and formulate an opinion about the website or company or blog that contains the writing. You really do get what you pay for. You don’t always realize the by-product of the inferior writing until you notice that your unique visitor numbers are down or your search engine ranking is taking a hit. Another problem that buyers may not realize is when they hire a writer to promote a product or service that they are selling. They may hire a generalist writer who knows nothing about writing effective copy or someone who knows nothing about the sales process. The purchaser will continue to spend money on the writing hoping for sales. Later on, they are perplexed that their sales are flat without realizing that the culprit is the writing. It’s just writing and not sales copy. I can tell you, as a person who has run a high-end professional writing service for many years, that good writing is not available for $16. “Article mills” don’t produce high quality writing that is recognized as such by every reader. (Or every prospective customer or client) For those people on a budget, who have to hire someone else to write their web pages or articles or press releases, you have to bite the bullet. Future success means investing in yourself or your business. The most successful corporations today did not get that way by buying cheap, inexperienced help. They built their brands the right way, making certain that everyone who read their ad copy or web content, marketing collateral or trade journal articles knew that they were the real deal. I am not the final arbitrator on this topic, but I wanted to include a few thoughts for those scrutinizing outsourced writing services. My advice would be to stay away from the ultra-cheap writers and invest in your future. You get only one chance to make a first impression. You are right in saying “it depends”. Outsourcing can be very productive if the website owner gets it right. But at the end of the day, business owners are in the best position to produce industry-related content to suit their readers. Having said that, time is often the major factor and sometimes a mixture of in-house and outsourcing works well. Many business now are doing outsource especially if this business are doing so much that they want to hire somebody else to do a particular work for them. Outsourcing Article Writing is not shall i say good or bad. It will only depend on a company or person if they wanted it to. The only thing is that when you outsource you need to know if that company or person you outsource delivers quality services. There is no reason for a beginning blogger to outsource his material, but if your expectations are correct, you may end up outsourcing simple articles and task. My recommendation is if your website is in English, only accept the work of native English speakers. Its not racist, its just makes good business sense. Outsourcing is not easy, especially when you are a beginner. You need time to find good “authors” and – of course – money. I prefer to write the articles myself. It’s free and it helps me learn how to write. I also prefer to make sure my voice is consistent throughout the site. Unfortunately, when your business grow and you have 4-5 sites or more, you are forced to outsource. That is the moment when sites like elanke, odesk, frelancer etc. come into play. I didn’t know about Textbroker. Thanks. One last thing. When you don’t want to outsource, you need a lot of time to produce that amount of content that will impress people. Yes, you may say quality matters. Indeed. Unfortunately quantity matters a lot. The first impression on a website or blog is determined by the visual appearance and the quantity of information. Content comes third. Yes, in time, content will be first but during that first encounter with a site, people are attracted by look and quantity. That is the reason why success takes a lot of time. My problem with oDesk is their customer service. Yes, the transactions are easy but one your hired employee bailed then you will have a hard time. I don’t want to bash at oDesk but their customer service is not helpful at all – I tried. I switched to a site called Remote Staff and hired Filipino workers (check: http://www.remotestaff.com.au/rs/candidates/ ) what I like about them is they provide me my own customer service who send me reports and address issues between me and my staff. No, I wouldn’t pay for outsourcing at least not through an online service and that’s because I’ve been one of those paid-per-article writers in the past and it’s nothing more than slave labor, IMO. After all, when you pay something like $16 for an article at Textbroker, the writer actually gets quite a bit less than that, yet still has to put up with the aggravation from Textbroker editors and the chance they might be demoted down to a lower star level after their next ‘review’. If I ever did pay for articles to be written, I would hire the writer myself and pay them directly. It’s the only way to ensure they’re making a fair income. I’ve used textbroker in the past. I’ve never used any writer lower than a lever 4. Some of the articles have been amazing and better than anything I could make. There have been a few that were pretty bad. One didn’t even contain any paragraphs! I recently tested the level 5 writers because I wanted to see how much better the quality was. I think I was unlucky because the article I got was on the lower end of the level 4 articles I’ve received in the past, even though I paid $25 for it. I discovered that Textbroker grades writers by their spelling, grammar and punctuation, and not by the quality of the content they produce. I get the best content when I submit directorders through textbroker to writers that produce great quality content. Openorders are good for finding good writers and getting articles fast, but since I’d rather get high quality content, I prefer placing directorders. Ted, that’s good to know! I didn’t know that they rate them based on grammer, etc. I have yet to splurge on a level 5 but I’m happy with most of the 4-quality articles I’ve requested. I’ve had a bit of trouble with a couple of people following directions (i.e. writing in the wrong voice – first person, etc.) but overall it’s been good. I agree that it’s better to use direct orders. 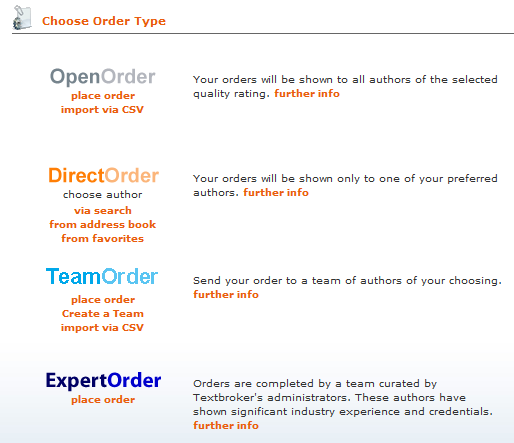 Text Broker is good, but I think Odesk is the best place to get writers with good writing skills. This is based on personall experience though. I have outsourced many times, even now. I ‘m getting good quality content from them. I have some affiliate sites that I have used a writer for. The first writers I found were terrible and I had to reject a number of articles. I have now found a good one who I trust, I dont mind writing but it boils down to time. The turning point for me was just paying a bit more, I pay about 25% above standard rate bit it saves me a lot of time and hassle. If I compare it to my own hourly rate it is still very cheap. Couldn’t agree with you more about TextBroker, I’ve been using them for a good while now and have always been very happy with the articles provided. I think it’s important for people to remember that it is certainly true that ‘you get what you pay for,’ I know quite a few people that have wanted a good quality article so popped over to ffiver.com! The best part is that they’re really surprised that the article they’ve paid $5 for to someone who has English as a third language isn’t particularly good! Thanks lisa, I am new to blogging and your articles have always been really informative to me ! Keep up the good work ! This is something I have considered myself as I struggle for time but always open to new ideas. Actually to outsource content is kinda good idea rather than having an inhouse writer. However there are cons and pros for this action. We’ll being on this field convincing the client to outsource work is kinda difficult task. Since client/business owners are very intelligent in their decision. I have been using a outsource article writer for the past 1 1/2 years. I have had a love hate relationship with the writers. Although it is great to have new content written the result are usually lack luster. A lot of problems with the language, a lot of repeated statements that just add up to the requirements of the articles. This has been my biggest gripe. Be careful of the person or people that you hire. You need to find someone that can really speak to your audience.